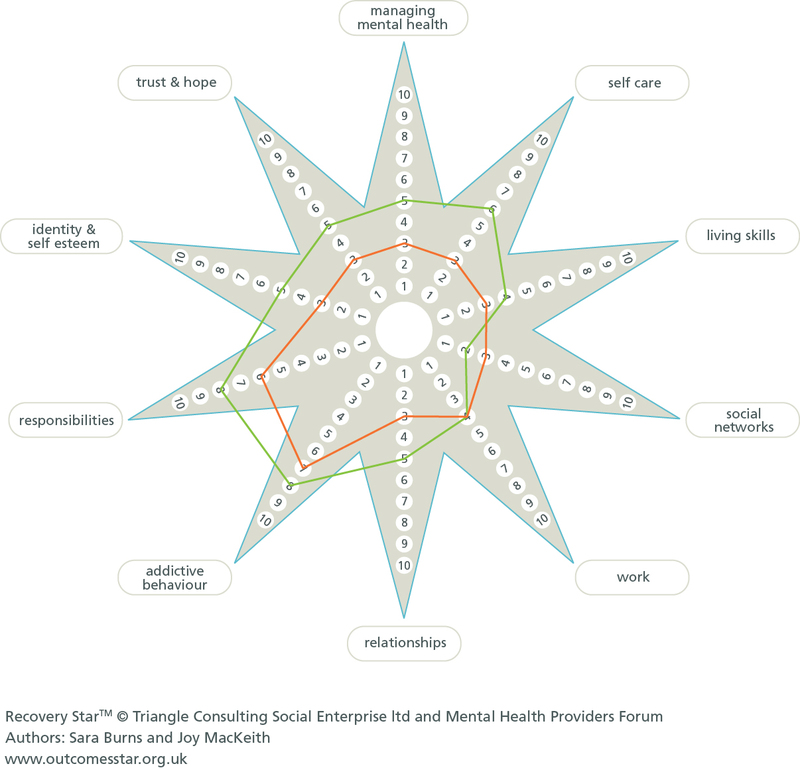 Person-centred thinking tools can be useful both for people using mental health services and professionals using recovery-based approaches, such as Wellness Recovery Action Planning (WRAP) and the Recovery Star, where the ethos and values underpinning them are the same. Here is what this can mean in relation to the Recovery Star. Clear outcomes are emphasised in the mental health strategy ‘No Health without Mental Health’, and are required in support planning for the plan to be agreed. 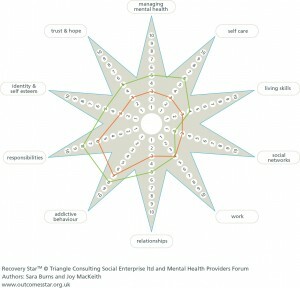 One approach is the Recovery Star, which is a tool for the assessment of needs and outcomes for adults of a working age, belonging to the Outcomes StarTM suite of tools created by Triangle (see www.outcomesstar.org.uk for information on licences and training). 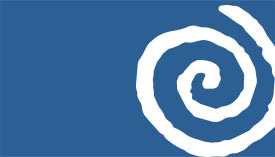 People rate themselves in ten areas of their lives on a ‘ladder’ from one to ten (one being a serious problem and ten indicating self-reliance). The ratings provide a way to measure progress and help to set outcomes. For example, if someone thinks that they are at the ‘Believing/Stage 6’ level in ‘self-care’, then they want to take responsibility for looking after themselves well. You could use the ‘working/not working tool’ to think together about what they are doing around self-care that is working at the moment, and which areas are not working that they want to change. You could also look at the level and ask what ‘positive and possible’ change would look like. Person-centred reviews include the question about the future, and are another way to help people think about their aspirations and to then develop outcomes from these. If someone is on the ‘Learning step’ on the ladder, then the person-centred thinking tool ‘4 plus 1 questions‘ could be useful. This will help you to think together about what the person has tried and learned, and what she is pleased and concerned about, to inform setting the next actions. Inclusion web: another very useful person-centred approach developed within the mental health field is called the ‘inclusion web’. This looks at both relationships and how the person uses her community. Whatever stage of the ladder the person is at, clearly describing how best to support her is important. If the person is at the ‘accepting help’ stage, then it is very important to be able to say what this help needs to look like for the person. The shift to a recovery approach from a more medical or system-focused approach means that rather than having the aims of the organisation or the clinicians as paramount, it’s the aims and hopes of the person who needs care and support that are central. Recovery comes from the service user movement, where many said that when they came into contact with psychiatric services, it felt like a life sentence – they were told ‘you are going to have this and be on medication for the rest of your life; you can forget about work or education’. But working in this way means that we are approaching recovery differently, by asking people what they would like to achieve and then helping them do that. You're here: Home • Health & Social Care • Mental health • Can person-centred thinking tools help to implement the Recovery Star and WRAP?